There’s been a winner of the illusive Catch the Ace in Perth. Bill Don, an avid dart player at the Perth Royal Canadian Legion Branch 244 was the winner of $13,100 after the draw on Friday, Jan. 25. Two Perth area men were honoured at our Hall of Remembrance Museum today, with the presentation of shadow boxes which have been crafted by MWO (Ret) Ken Miles, MMM, CD, of Pembroke. Hundreds gathered Sunday, Nov. 11 in Perth for the Remembrance Day Memorial Service, hosted by the Perth-Upon-Tay Legion Branch 244. Unfortunately, Perth’s Project Trauma Support program has proven to be very popular. 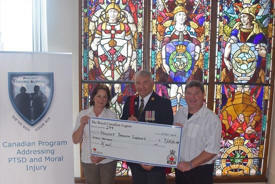 With 14 "cohorts" so far, and with a total of 150 first responders and military personnel having gone through the PTSD program at Tay River Reflections Medical spa, the program has also recently embarked on a partnership of sorts with the Perth Royal Canadian Legion Branch 244. With the help of Perth Upon Tay, Branch 244 , Royal Canadian Legion replaced a 100 year old rotted cross erected by the Gamble family in memory of Andrew Gamble, killed at the 2nd Battle of Passchendaele.